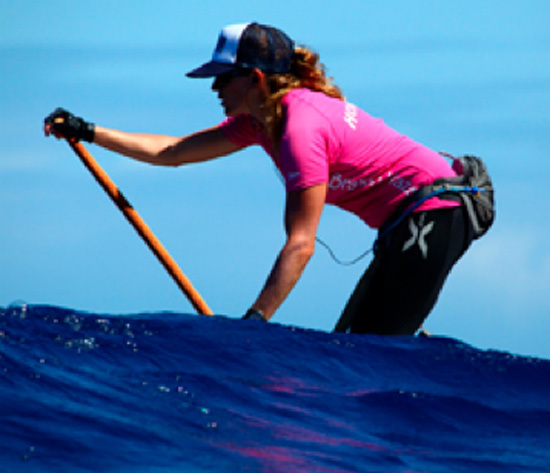 Jenny Kalmbach earned a second place finish in the Battle of the Paddle women’s division Saturday on Oahu. In the Elite Women’s division, Kalmbach’s time of 1:35:55 was just a minute behind champion Candice Appleby of Honolulu. In Sunday’s Hawaii Kai downwind distance race, Kona’s standout stand-up paddler won the women’s 19-29 division Unlimited category with a time of 1:37:53, coming in ahead of 19 other women. The Battle of the Paddle was billed as a world-class stand-up paddle festival and exposition that included races and demonstrations for all ages and skill levels. Staged at historic Duke Kahanamoku Beach (Waikiki) May 14 and 15, the Battle of the Paddle was more than an ordinary paddle race. For the sport’s top paddlers, the five-mile Elite Race was a championship styled surf race that offered a cash purse of $25,000. The Battle of the Paddle also had an Open Age-Group Race, Distance Race (Hawaii Kai Run), Kid’s Races and SUP Relays. At last year’s event, the Hawaii Kai Run had the largest SUP field ever assembled in Hawaii with 230 paddlers. This year, 168 paddlers completed the course.